50 year old worker’s wife, for years suffering from chronic arteriosclerosis and myocarditis who, 2 days before photographing in the clinic, had sustained an apoplexic attack. The consequence was right side hemiplagy, nearly entire motor aphasie and facial paralysis in the area of the lower right half of the face, with extensive involvment of the mouth, nose and cheek muscles. Of the two photographs the left portrait is taken of the resting pose, the right during an effort to speak. The first picture requires little in the way of explanation. While the creases of the brow, the region of the upper orbital crests, of the upper eyelids and of the nasal bridge appear perfectly shaped the same on both sides, identifiable is a loose swagging of the lower eyelids (especially in the outer corners), a shallowing of the cheek skin* with a flattening of the nasolabial folds, as well as the drooping of the right nasal flares and of the mouth corners with slight extension of the right half mouth cleft. 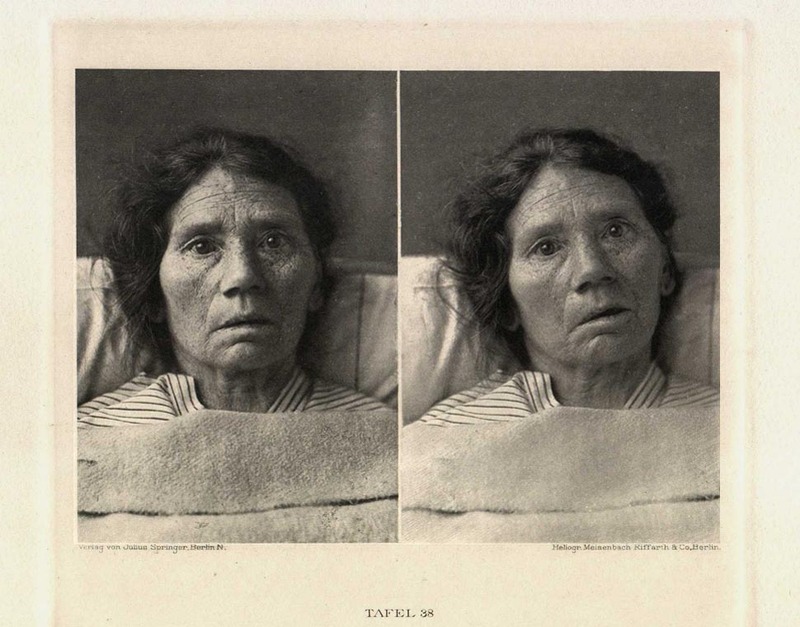 In the second photograph it is quite beautifully obvious, how during the effort to speak only the left half of the mouth is moved and opened, while the right remained passive and somewhat pulled over.